This quesadilla is inspired by my older brother Kyle because he always orders unique combinations on his pizza, usually involving pineapple. I always thought it was weird because my favorite toppings were pretty traditional…cheese, sausage, pepperoni… etc. Pineapple belongs in pineapple upside down cake, not pizza! Wrong! This combination changed my mind. Kyle ordered a pizza with bbq sauce, bacon, jalapenos, and pineapple. Seriously, one of the best flavor combinations ever. 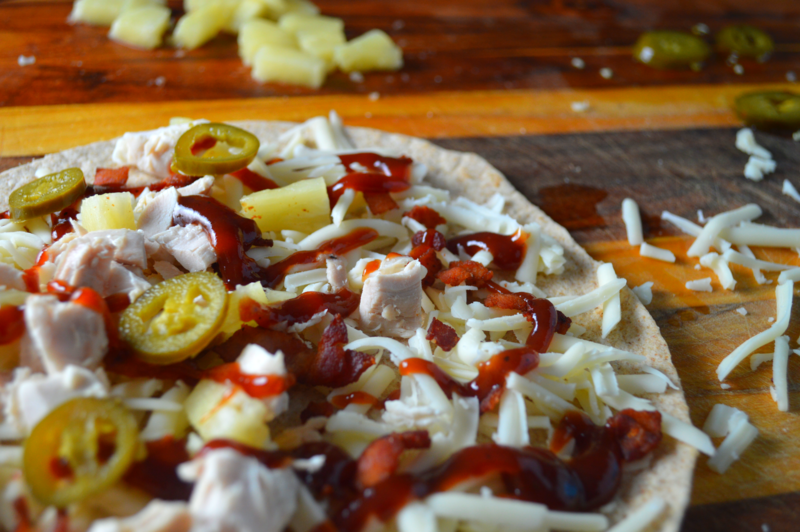 The smoky bacon, spicy pickled jalapenos, and sweet pineapple really compliment each other. The kicker for this one is the bbq sauce which brings it all together. Remember that this is all about a balance of flavors, so layer your quesadilla with everything in moderation. We don’t want to overpower the whole thing with pineapple or set your mouth on fire with handfuls of jalapenos. I like to start with whole wheat tortillas, but you could certainly use flour or corn if you prefer. Then, I layer on some Monterey Jack cheese. I like to use Monterey Jack because it is a mild cheese that melts really really well. Then, I sprinkle on some chicken, bacon, pineapple, jalapenos, and drizzle with bbq sauce. 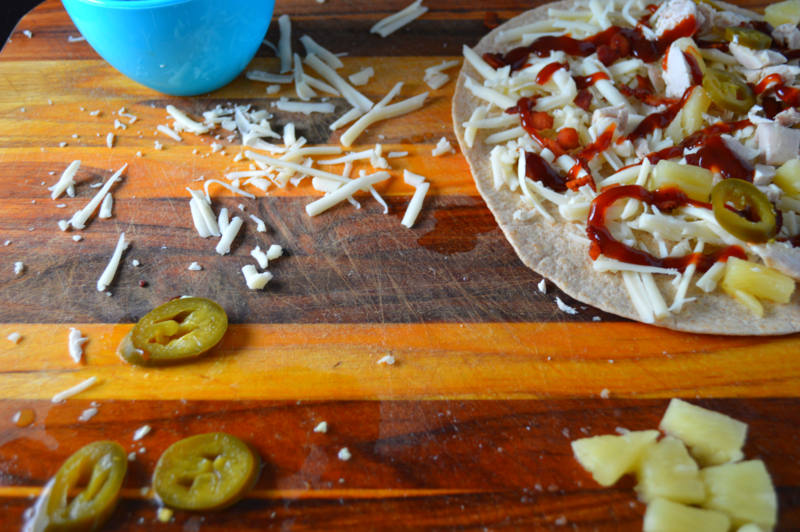 I like to sprinkle with a little more cheese before topping it off with another whole wheat tortilla. I tend to sandwich the filling between layers of cheese to keep it all together. Top the quesadilla loosely with foil to help the cheese to melt while the tortillas get golden brown and crispy. Cut into triangles and dig it! You can serve with a side of bbq sauce or ranch for dipping. Heat a skillet to medium heat and spray with cooking spray. Add one tortilla to the skillet, a sprinkle of cheese, half the chicken, half the bacon, half the pineapple, a swirl of bbq sauce, jalapenos, more cheese, and another tortilla. Cover loosely with a piece of foil. Cook for about 3-5 minutes on the first side. You want the cheese to melt and the tortilla to become golden brown. Flip the quesadilla and cook for another couple of minutes on the other side. The second side always goes faster than the first, so keep an eye on it. Remove from the skillet, slice, and serve with extra bbq sauce on the side. So Good!!! I’m not a huge BBQ sauce fan, either! !